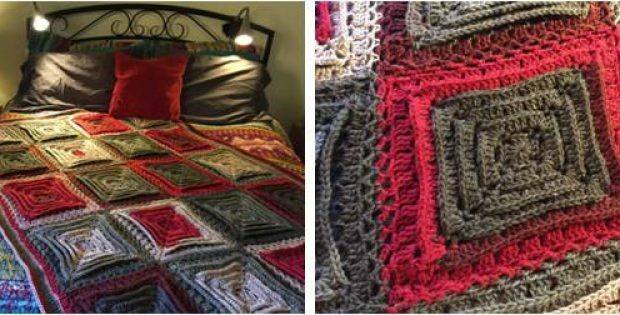 Create a hypnotic tiles crocheted afghan that will look elegant on your bed. The gorgeous bedspread is made from 20 squares that have been joined together. It is not a particular difficult pattern. However, it is probably best suited for more intermediate crocheters. Once completed, this amazing afghan should measure approx. 46 inches by 60 inches. Do you prefer metric measurements? The finished afghan should measure about 118 cm by 152.4 cm. These stunning hypnotic tiles is another great design of Michael Sellick over The Crochet Crowd. You can access written and video tutorial pattern of this delightful crocheted hypnotic tiles for FREE. It is especially easy if you follow along with the video tutorial below. Watch this great video tutorial and work along with Mikey! Featured images(s): The Crochet Crowd – thank you!